Picture yourself kicking back in the Kimberleys and ‘reeling in’ the good times at our world class fishing spots. The Kimberleys are home to 52 unique freshwater species, 16 of which are native to the area. 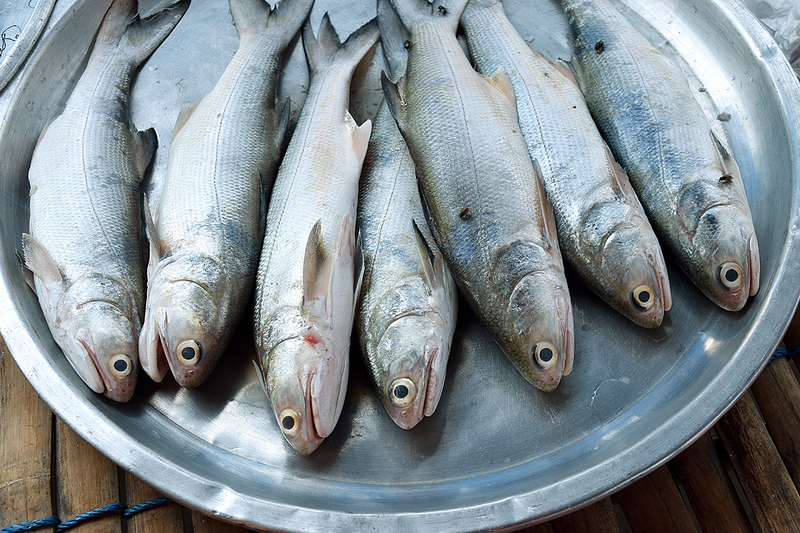 We’ve got Barramundi, Salmon, Triple Tail, Bluebone, Rankin Cod, Sea Perch, Mackerel, Tuna… well, you get the picture. The diversity of the region makes it the perfect spot for marine watching too. If you prefer keeping your eyes peeled rather than dropping a line in, you might be lucky enough to spot a Freshwater Whipray, Mouth Almighty or a Short-finned Eel. A comprehensive list of fish species of the Kimberleys can be found on the fishing website of the Western Australian Government. If, however, you’d like the scoop on some of the most sought-after fishing species, we’ve created a profile on our two biggest contenders. The Kimberleys are home to amazing, world-class sport fishing species. The biggest of these, the hardest fighter on the line, and the one that draws fishing enthusiasts from across the globe, is Lates Calcarifer, or the Barramundi. These beauties can grow up to 1.8m in length, and are usually around the 1.2m mark. Adult fish tend to congregate around estuaries where the carnivorous species can find bountiful prey. Great places to fish for these elusive and prized specimens are Collier Bay, Ivanhoe Crossing, Tumblegoodiron and Doubtful Bay. Kimberley Cruise Escapes has our own very own ‘secret spot’ too, which we’ll visit during our 6-day fishing expedition. Barra take just about any bait too, which is handy if you don’t want to spend your holiday lugging around a tackle box of lures and baits. With their goggle eyes that are just slightly too far forward on their face, Threadfin Salmon are a strange looking fish. But there’s more to life than how you look, and these guys are absolutely delicious. Threadfin Salmon can grow up to 1.7m long, so are slightly smaller than the Barra and don’t carry quite the same reputation for putting up a fight when they’re caught. But though they aren’t as feisty as the Barramundi, they won’t be reeled in without a fight. Threadfins will fight you to the bitter end and it’s a testament to the quality of sport fishing in the area that they don’t take number one slot for the hardest fish to reel in. When it comes to bait, Threadfins prefer mullet and live prawns and go for minnow lures in a pinch during low tides. Quandong and Doubtful Bay are going to be your best bet for catching one of these. Caption: The “goggle-eyed” Threadfin Salmon. If you’re not here to fish, there’s still an incredibly biodiverse environment to explore in the Kimberleys. Crocodiles and Alligators lurk around in the shallows, basking in the hot Kimberley sun. But don’t worry, we keep many designated swimming spots out of reach of these magnificent predators. Under the waves, we’ve a host of bright corals and sponge reefs that provide shelter for innumerable smaller fish. The Kimberleys also serve as home to a staggering six out of the seven known oceanic turtle species. In the whale watching season, dozens of Humpback whale pods can be seen on their long, cold migration to escape Antarctica’s icy winter waters. Unfortunately, global rising water temperatures are threatening the biodiversity of the Kimberleys. The lack of large, built up cities in the area has kept it virtually pristine, but we’re beginning to see some coral bleaching and some bays closed due to overfishing. For this reason, we request that anybody taking a trip to the region respects the delicate balance of life that exists here. We ask that you release any fish you don’t plan on taking to your plate, to give them a chance to reproduce and keep our fish population flourishing. If you’re champing at the bit to get out there and start fishing, Kimberley Cruise Escapes offers a 6-day Fishing Expedition that provides the fishing opportunities you’ve always dreamed of. On our first day, you’ll discover the Yampi Sound; a small collection of islands and oceans along the coast. Here you’ll be fishing for a variety of fish, including Giant Trevally, Mackerel, and Queen Fish. Day Two brings you to Secure Bay, on the hunt for Barramundi, and we continue the search into the third day at Collier Bay – where Barra love to hide. On our fourth and fifth day, we set up shop at Doubtful Bay, which we mentioned above as one of the premier spots for Threadfins. It’s not uncommon to catch plenty of Barra here too, but if you need another chance – we’ll be heading back to Collier on day six. Sound like 6 days in paradise? Get in touch with us and start planning the ultimate fishing experience in some of the most beautiful fishing spots in the world.